during qualifying for the Monster Energy NASCAR Cup Series AAA Texas 500 at Texas Motor Speedway on November 2, 2018 in Fort Worth, Texas. 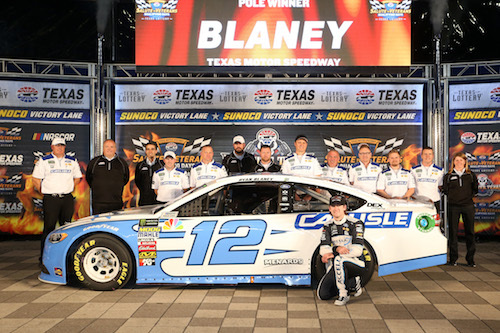 Ryan Blaney claimed his third pole of the 2018 Monster Energy NASCAR Cup Series season Friday when he posted a 26.932-second/200.505 mph lap in the third of three rounds of qualifying at Texas Motor Speedway for Sunday’s AAA Texas 500. Ford claimed the top-five starting positions, three by the Stewart-Haas Racing trio of Clint Bowyer, Kevin Harvick and Aric Almirola. Bowyer will start next to Blaney on the front row, while Harvick and Almirola line up in row two. Brad Keselowski qualified fifth. Toyota driver Denny Hamlin was the highest-qualifying non-Ford driver in sixth and the only non-Ford driver in the top-eight. Kurt Busch and Logano were seventh and eighth. Logano, along with Bowyer, surpassed the 200 mph mark in the last round of qualifying, but Logano was fast to cross the 200 mph barrier, do so in the second round with a 26.964-second/200.267 mph. Blaney was fastest in the opening round, but his pole-winning lap in the final round was the fastest, overall, of the qualifying session. Harvick was second to Blaney in round one and Logano in round two before winding up third. William Byron was the highest-qualifying Chevrolet driver in ninth. He was the only Chevrolet driver to advance to the final round of qualifying. All eight playoff drivers advanced to round two of qualifying, but Martin Truex Jr. and Chase Elliott didn’t get past the second round. Truex wound up 13th and Elliott 16th. 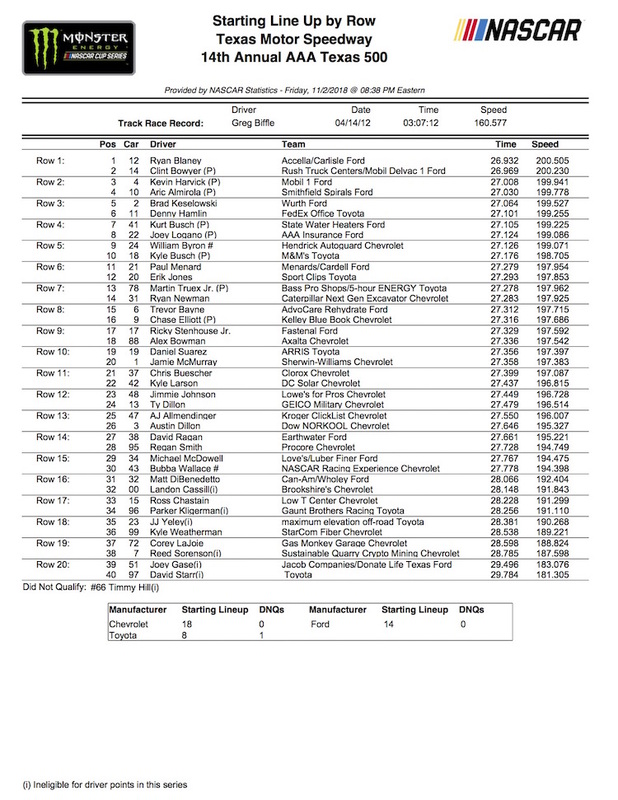 Forty-four drivers made qualifying attempts. Timmy Hill was the only driver who failed to make the race.